Very fortunately, down the street from our house on Shelter Island is the home of the talented garden designer Martha Baker. Martha is a force of style in nature. She is funny, chic, glamorous, beautiful, creative, humble and TALL all at the same time. Martha does all kinds of residential projects, but generally her work has been focused on creating outdoor environments for large -scale residential estates in the US and abroad, with many high profile clients and books to her name. Her home and garden is a work of art, with each corner casually, yet artfully composed and seemingly magazine -ready. Her landscape has so much dimension to it that you really need days to absorb it all. Martha was kind enough to spend some time with me, which I have been dying to do for the longest time, both to learn from an expert in the field and also to try to document some of the highlights. With my 'island brain' and her impeccable standards as a respected designer in the field, I can only hope I am doing her justice here. You can see more here at Martha Baker Landscape Design. A small arched side entry is carved out of a dense hedgerow of Privet. Martha is into creating outdoor living rooms, considering comfort, longevity, beauty, and views. Her veranda faces the Bay and feels like a gracious and perfectly proportioned natural extension of the house out onto the landscape. The pergola has a hearty planting of Wisteria, which she has a love/ hate relationship with..."Wisteria is great" she says, but hard to maintain and grows so fast that it needs to be tamed regularly. A planting of boxwood and hydrangeas surround the terrace, softening the edge. Across the street on the bay side is the entrance to Martha's walled garden. The entry is exquisitely marked with two statuaries from Unique Stone. Martha's entire garden is punctuated with these small treasures and amazing stone pieces she has come across over the years, adding a personal feel to the garden. The fence is tied to a more elaborate arbor structure, which is made out of locust wood by her son who is a sculptor/fabricator. His name is Charlie Baker, and you can see more of his work at Baker Structures. The Clematis has just started to bloom, lending an element of grace to the entry. Once through the gate, the long view out the dock to the boat. The arbor is an extension of the main axis to the dock and also is a sculptural element in the garden, now partially covered with the flowing Trumpet vine, and also Akebia (or Chocolate vine) which both provides some shade and also softens the structure. 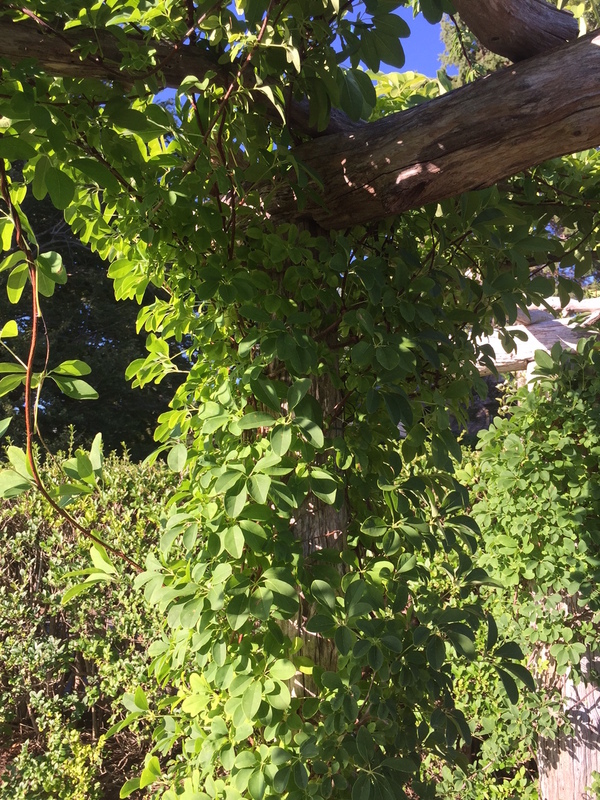 Akebia (Chocolate Vine) is one of Martha's favorite vines because it grows tightly to structure and does not get too out of control so that the arbor still retains its architectural definition. Akebia is a twining woody deciduous vine, and is also shade, salt and deer tolerant with fragrant, dark purple flowers in March-April. It supposedly smells like chocolate although don't get your hopes up, this was is not my experience and frankly who needs that anyway. Martha's sensibility is keenly attuned to seasonality, and each part of her garden has been considered to provide interest during all seasons, which is no small feat, especially located right on the water where wind shear and salt are major issues. Off to the right side of the arbor is a small seating area that Martha arranged in a sort of casual island chic way. The patio is surrounded by large drifts of Miscanthus Sinensis 'Morning light', Hydrangeas, and Pennisetum. The plastic thatched umbrellas are hilarious, and oddly stylish at the same time and move with the breeze along with the grasses. The grey planters are from Campania and are planted with Plumbago, a tropical plant also commonly known as 'Leadwort'. The patio is a mix of bluestone in a running bond pattern, mixed with strips of brick at the edges. A fire pit provides warmth at night along the water's edge, and many opportunities for evening s'mores making (and drinking, of course). A view looking back to the seating area and arbor beyond. On the other side of the arbor is Martha's wild side: A mix of Hydrangea, Sedum, Casablanca Lillies, Hibiscus, Joe Pye Weed and Nepeta all growing in a gorgeous romantic tangle together. Martha mentioned that Hurricane Sandy took out over 50% of her garden, but you would never know that now--the garden is overflowing, and full of flowers in bloom even in late August. The Sedum 'Autumn Joy' were in full effect, a great late summer perennial to remember for that late color that often is hard to find. All corners of the property are considered, with blooming flowers and vines abound. Martha is a huge proponent of planting in pots: this terra cotta pot is planted with Torenia and Scaevola, two gorgeous purple annuals that are not too fussy, are pretty drought tolerant, and their flowers just so bright. Willy never leaves her side. Note Martha's dress, a boxwood print, blending way too perfectly with this landscape.